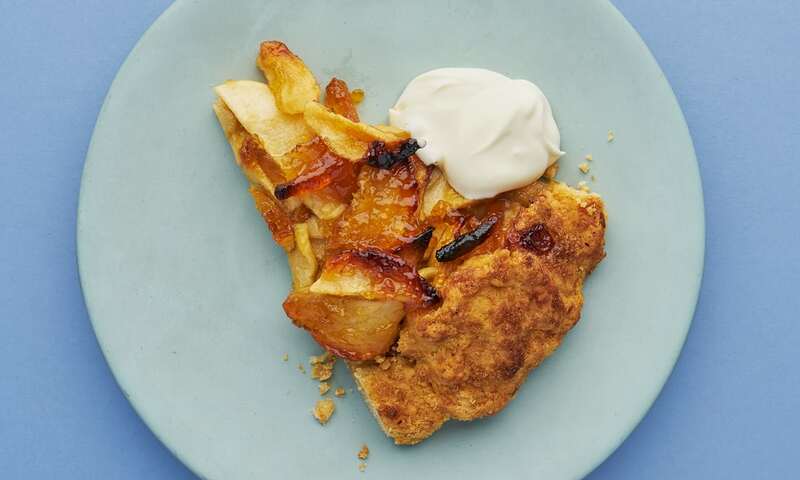 Marmalade on buttered toast may have no rival but the deeply moreish, bittersweet topping for this apple tart. Marmalade is a big deal in my family, and my three children have all inherited a love of it. Our family recipe, which is in my book, Home Cook, is made with five different sugars, and is as dark and treacly as you could hope for. It’s hard to improve on marmalade on buttered toast but, inspired by an ingenious marmalade cocktail I had the other week, I’ve been experimenting recently. Its deep bitterness turned out to be so revelatory on an apple tart that a whole new world of possibilities opened up before my eyes. For the pastry, put the flour, sugar and salt in a food processor, add a third of the butter and pulse to the consistency of breadcrumbs. Add the remaining butter and pulse a few times, until the butter pieces are the size of peas (it’s these bits of butter that make the pastry flaky). Turn out into a large bowl, then start trickling in the water, tossing the pastry with your hands and letting it fall through your fingers as you do so. Keep folding the pastry like this until the dough begins to clump – two to three minutes – then press into a ball, flatten slightly, wrap in clingfilm and put in the fridge or freezer for at least 30 minutes. Heat the oven to 200C (180C fan)/390F/gas mark 6. Put the marmalade in a small pan, warm through until it turns to liquid, then pass through a sieve to separate the peel from the jam. Put the peel in a bowl and return the liquid to the pan; keep it warm, so it doesn’t set again. Mix the apples, sugar, orange juice and salt with the peel. Roll the pastry into a 30cm circle and transfer to a baking sheet lined with greaseproof paper. Pile the apple mix on to the pastry, leaving a 4cm border all around the edge. Bring up the sides of the pastry, and fold them over the fruit, crimping them a little, to create a dam so the juices won’t breach the rim. Brush the exposed pastry with melted butter and sprinkle with the remaining tablespoon of sugar. Drizzle the sieved marmalade all over the top, then bake for 30-35 minutes, until golden. Remove and leave to cool slightly before serving with creme fraiche or cream. A marmalade and English mustard glaze was a fine topping for a recent rolled gammon joint, but with the addition of some molasses, raisins and orange zest and juice, I turned the excess into an excellent relish. I also love a warm marmalade topping on a sponge or steamed pudding, for a sultry take on lemon drizzle cake; eat it in a pool of double cream. If you can, make double the amount of flaky pastry: it’s a great vehicle for tarts: try pancetta, leek and a good cheese such as Lincolnshire Poacher.